In the vast sea of iOS fitness tracking options, one app in particular is beginning to rise above the rest – GrowBIG. This amazing fitness tracker has broken the mold by revolutionizing the way you track your fitness progress. Designed by bodybuilders for bodybuilders, and all levels of fitness enthusiasts, GrowBIG will definitely help you get stronger, get fitter and grow bigger. To begin tracking your transformation, you will need to enter some personal information and then select which body measurements that you want to track. On a side note, if you use Apple’s Health app, then you will be pleased to know that GrowBIG integrates with that app which makes gathering your personal details even quicker. The Body Measurement tracking section includes options to track weight, height, lean body mass, Fat Percentage and measurements for body parts like biceps or chest. Additionally, you can take a photo of yourself as you begin this incredible fitness journey. Just in case you forget to enter your body measurement data every week, we have a feature that you can enable to get weekly reminders. After a few weeks, you can start viewing your body measurements via charts and graphs, which are effective tools for tracking and motivation. Throw away the old-school fitness journals and notebooks because GrowBIG will take your routines to the next level. Not only can you design and share your own custom workout programs, you can also upload professional or celebrity workouts, and view the growing library of workout programs. Once you have chosen a pre-designed routine, or finished creating your own, you can then schedule your workouts in advance by using the handy scheduling feature. 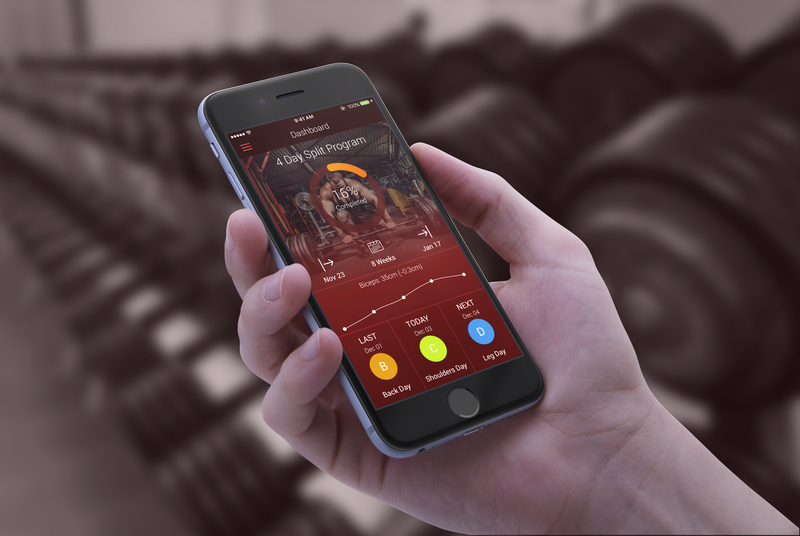 And, if that wasn’t enough to get the blood pumping, you also have the option of entering past workouts into the app to view and track your progress. GrowBIG has a few options for users to view their workout progress. The first option is to see what you have done in your current workout. In fact, you can actually view the progress in real-time. The second option is viewing the progress of your workout program in the Program Log. Here, you will be able to see charts and graphs of things like completion time, Total Lifted and Power Level, and your Body Weight over a period of time. All of these stats are displayed with visually appealing graphics. If you can’t find an exercise in our growing library, then simply create it through our custom exercise design feature. Just choose the muscle parts that the exercise targets, enter the name, find the exercise on YouTube without having to leave the app, enter a few details about the exercise if necessary, and save it. Not only will you be able to quickly add this custom exercise to your workouts, but you can also share it with other users. This design process is so smooth and efficient, it has all of our users singing its praises. For those of you that have more complex workouts, we have an advanced feature for entering the specific details of each and every set. The exercise and workout data entry options are automatically set at Simple. To access the Advance features, just click on Advance in the top right corner when you are on the screen that chooses an exercise to add to your workout. In the Advance section, you will be able to choose or enter information like drop sets, increase or decrease weight, increase or decrease reps, and much more. This Advance section really sets GrowBIG apart from the competition. The user-friendly interface makes it very simple for users of all levels to navigate the app and enter information. There’s also quick access to your personal information, workouts and calendar. If you need help with any section or feature, there’s always a help tutorial every step of the way. The stunning graphics provide users with an enriching experience that can’t be found anywhere else. From the colors to the anatomical figure, GrowBIG’s cutting-edge look and feel is inviting, exciting and one of a kind.